Next step: Open your very own macaron shop. With their crispy meringue shells and smooth ganache filling, macarons are swoon-worthy. They're pretty, they're precious, they're delicious, but they also seem impossible to make at home. But how do you achieve the perfect balance between crispy and chewy? How do you get a super smooth top? How do you make them look so pretty?! To answer all these questions and more, we made hundreds of macarons over several months and used those learnings to develop our own recipe — that you can make in your own kitchen. Traditionally, macarons are made with an Italian meringue, where you drizzle a hot sugar syrup over the egg whites while beating them. To do that, you need a stand mixer and a candy thermometer. 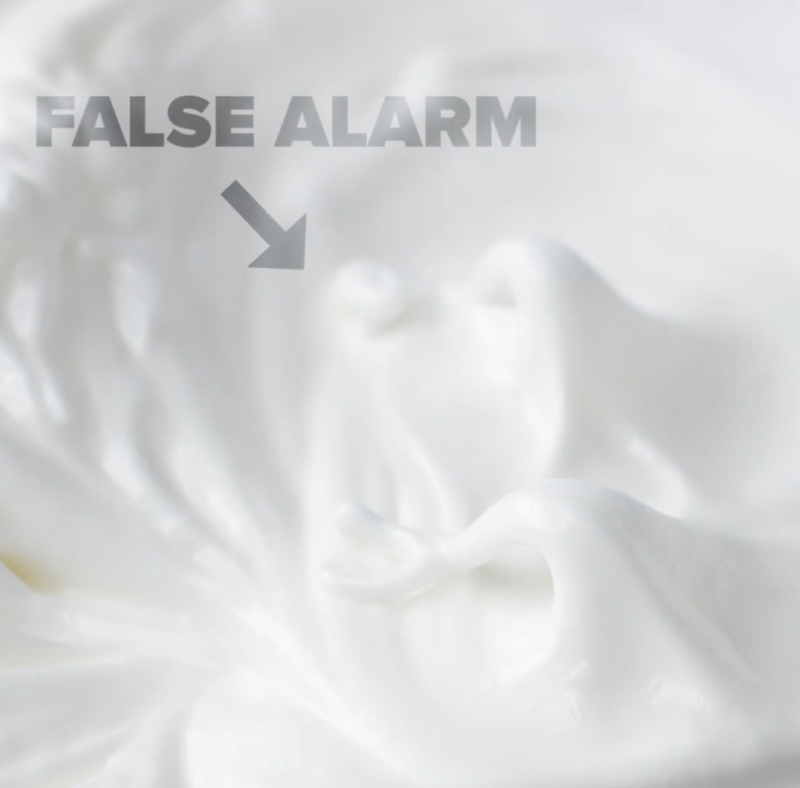 Since those aren't always kitchen staples for everyone, we decided to make our recipe more accessible by using a French meringue instead, no fancy equipment needed. Here's what we found out was crucial to making the best macarons at home. You can also find Tasty's Macaron Recipe at the bottom of this post. Fair warning: We made the recipe as easy as we could, but it's still pretty involved. That's part of the deal when you want to make macarons. But the good news is: They're totally worth it. 1. First thing first, make sure the weather is on your side before you decide to get started. If it's very humid where you are, your meringue shells may start weeping (releasing some liquid) and you don't want that. The ideal time for macaron-making is on a dry day. 2. Let the egg white come to room temperature for at least thirty minutes before you get started. This will result in a much fluffier and airier meringue. 3. This is not macaron-specific but more of a general pro-tip: Use your hands instead of the egg shells to separate the whites from the yolks. You could alternate between eggshells but you risk puncturing the egg yolk and getting some eggshells in there. Using your hands is actually a very easy way to go. Just make sure you wash them before you do that, eh? 4. When it comes to your dry ingredients, the finer, the better. So if you have a food processor, it's time to use it. Pulse your dry ingredients together at least ten times. You want to get the ingredients as fine as can be to get smooth shiny tops for your macarons. If you don't own a food processor, don't worry. The macarons will still be delicious. 5. After you've pulsed the dry ingredients in the food processor, sift them a few times to make sure they're at their finest. This may seem like a lot of work, but 1. That's how you get great macarons, 2. Macarons are worth the effort. 6. Add a pinch of salt to your egg whites before you beat them. That'll help stabilize them. 7. Beat the egg whites until they're frothy and no longer translucent and then start gradually adding the sugar. If you add too much sugar at once, it'll deflate all the air you just beat into the whites. 8. 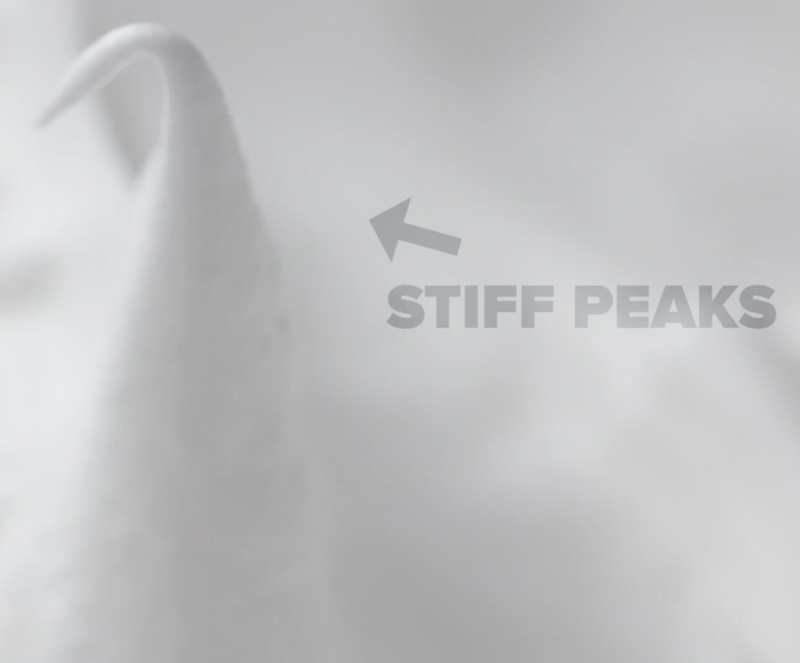 Once all the sugar is added, keep beating until you get stiff peaks. 9. To double check if your peaks are stiff enough, flip the bowl upside down, if nothing moves or falls out, it's ready. 10. Only add the vanilla once you've beaten the egg whites to a stiff peak stage. If you add it too early, it can prevent you from getting those stiff peaks. 11. If you're using food coloring, use gel instead of liquid food coloring. Gel food coloring is more concentrated and you'll get a much more vibrant color using it. 12. When it's time to combine the wet and dry ingredients, start by adding only a third of the dry ingredients to the meringue, and fold it in gently until combined. This folding process is called macronage. You can then add the rest of the dry ingredients and continue the process. 13. You know it's ready when the texture looks like wet sand ribbons and you can draw a figure 8 with the batter. Once you can make a figure 8 with the batter without it breaking, you know it's ready. Stop mixing the batter then, or you might overmix it. 14. Pipe four dots of batter on the baking tray to secure the parchment paper. 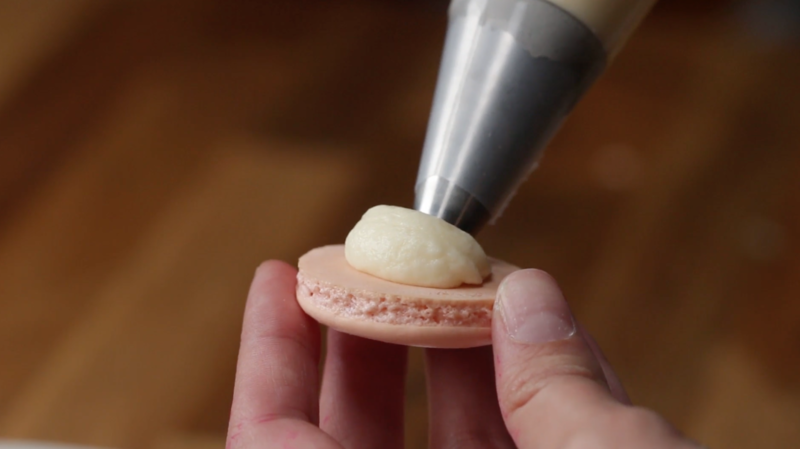 That way, it won't move around when you're piping the macarons. We prefer parchment paper to a silicon mat. After many tests, we found that silicon mats can make the cookies a little moist, which is not an issue with the paper. 15. The classic size of a macaron is about an inch and a half wide. You can buy a template for piping, or you can eyeball it! That's what we did. 16. 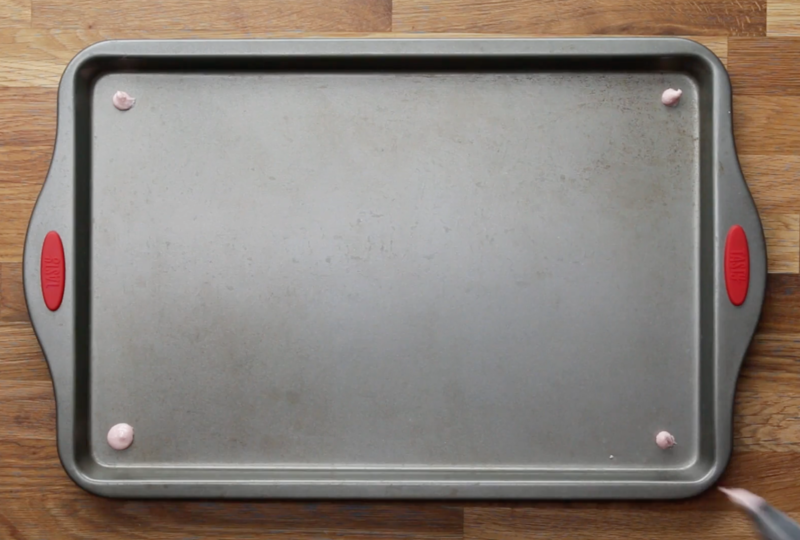 Now this is crucial, so make sure you don't skip this step: Once you've piped your macarons, tap the baking tray on the counter several times. This will eliminate all the air bubbles and ensure you get a smooth top. 17. Let your macarons rest at room temperature for an hour, until they develop a sort of skin on top. 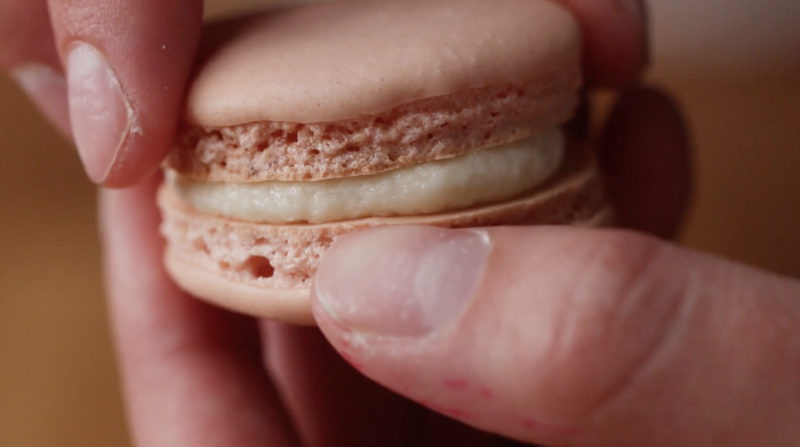 You should be able to brush your finger back and forth on the macaron, without indenting it. That's how you know they're ready for the oven. 18. When you bake them, make sure the oven is at the right temperature and DO NOT OPEN THE OVEN DOOR during baking. If you own an oven thermometer, now is time to use it, because getting the oven to the right temperature is crucial. And if you open the oven door during baking, your macarons could deflate, and nobody wants that (especially after you've already put in so much work). 19. Let the macarons cool down at room temperature for about 20 minutes before transferring to a wire rack so they can cool down completely. 20. For the filling, we made a vanilla buttercream filling (recipe below), but you can go wild with anything. 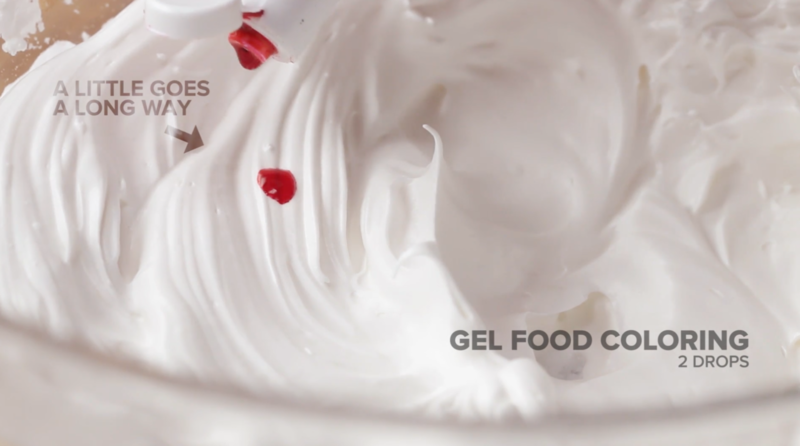 Flavor your buttercream with different extracts, make a chocolate ganache, use lemon curd, or even marshmallow fluff (as long as the French don't know about that one). Go crazy and experiment, that's part of the fun. 21. When you're piping the filling, make sure you don't pipe too much of it. A dollop smaller than the size of your meringue shells is the way to go. When you put the macaron together, you'll push down the filling and it'll fill the edges too. 22. Ok, one last thing: You're gonna have to wait at least 24 hours before eating your macarons for the best result. We know. It's a bummer! But you've come this far, what's an extra 24 hours? 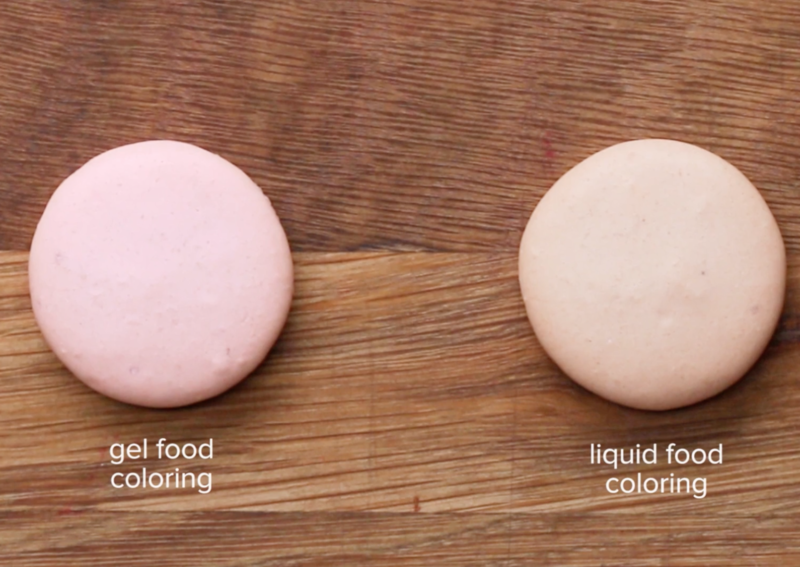 In all seriousness, this is actually important as it'll help your macarons develop the best flavor and texture. And after all this work, you deserve only the best! In a separate large bowl, beat the egg whites and the remaining ½ teaspoon of salt with an electric hand mixer until soft peaks form. Gradually add the granulated sugar until fully incorporated. Continue to beat until stiff peaks form (you should be able to turn the bowl upside down without anything falling out). Add the vanilla and beat until incorporated. Add the food coloring and beat until just combined. 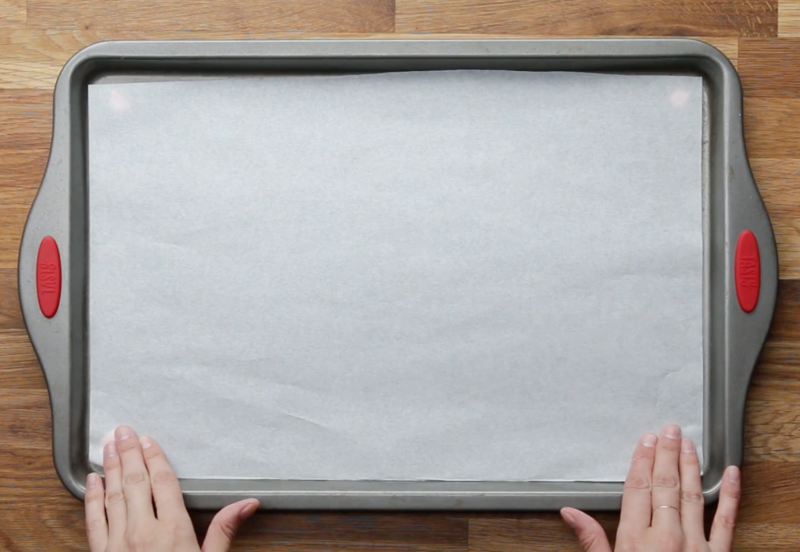 Pipe the macarons onto the parchment paper in 1½-inch circles, spacing at least 1-inch apart.